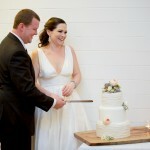 I can hardly believe it has been just over a year since Josh & Kelly’s wedding at Rainbow Beach! I thoroughly enjoyed meeting this beautiful couple in person to finalise the details for their cake, and was thrilled to receive a very kind and thoughtful note from them afterwards. 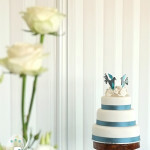 I am delighted to share a photo of their beach-themed wedding cake with you today, thanks to Josh & Kelly, and Photography by Bambi. 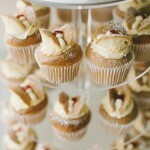 Sand, starfish, seashells and a whole lot of love for Josh & Kelly’s Rainbow Beach wedding cake. Photo credit: Photography by Bambi. Josh & Kelly chose a different flavour for each tier of the cake: caramel mud cake for the top tier, and white chocolate mud for the bottom tier. 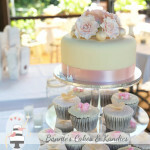 The design was inspired by a photograph of a cake by ‘Cake That’, but altered further to suit their square shaped tiers. 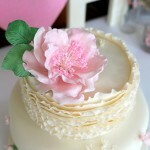 I also added a row of edible fondant pearls around the base of each tier to add an extra touch to the beach theme. 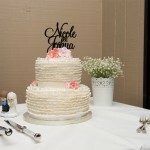 This cake incorporated three things that I absolutely love – frangipanis, square tiers, and caramel mud cake!